Daniela Edburg in her knit artworks, "portrays intense characters dealing with their restlessness and the passage of time. The element of knitting is a constant, as a form of occupational therapy or channeling an obsession." In another collection called Drop Dead Gorgeous, her subjects are killed by consumer goods in super-saturated brightly colored environments and clothing. Essentially bathing in color. This time her model is subdued and expressionless. Edberg was born in Houston, Texas, and grew up in San Miguel de Allende, Mexico. She earned her degree in Visual Arts at Academia de San Carlos in Mexico City. Her work has been exhibited in art centers worldwide. She is represented in the U.S. and Mexico by KUNSTHAUS Miami/Sante Fe and YAUTEPEC Gallery in Mexico City. In Italy she is represented by SPAZIO NUOVO. Similarly, Lisa Anne Auerbach uses knit in her photos, yet in a dramatically different way. 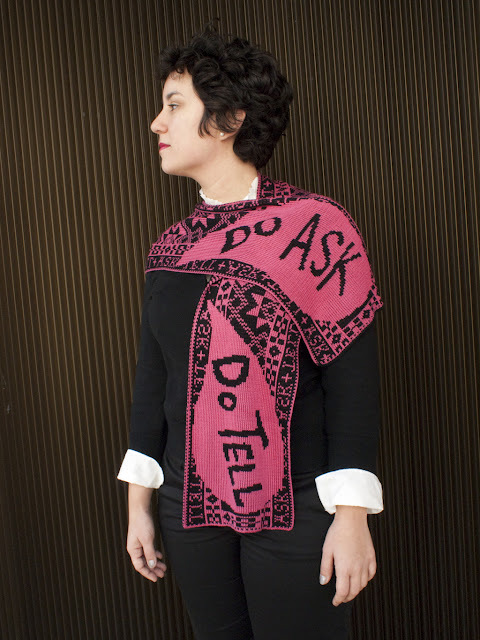 Auerbach is an L.A. based artist that uses knit sweaters(among other things) to convey messages of social import. She overtly connects with her viewers by the means of photo-collage(in this image) and by using everyday objects that we recognize in the modern world. A laptop, a bicycle, books, and bowling pins are just some of the things she holds in the photos. But....that's not the point, what she knits into the sweaters are phrases like "We are all TERRORISTS/We are all HEROES." Auerbach's story goes that she took up knitting after she graduated from the Art Center College of Design in Pasadena, because she could no longer use the school's darkroom. She has taken the two skills and combined them in a magical symbiosis to fantastic new heights. Here again, the environment affects the artist. In fact, both artists choose outdoor settings to convey the natural world and sometimes indoor settings that they connect with personally. However, in Auerbach's work (most of the time)she is the model. So, she is making the statement and also putting her face and name on it. The craft of the hand in both Auerbach's work and Edburg's is nothing short of incredible. Knitting or crocheting for those who have done it is time consuming, and really takes a lot of patience and concentration. The process that Auerbach uses to create her images makes her appear as if she is in motion, active. When I first designed this piece a few months ago, I thought of it as a protest to the military ban on gays serving openly. But, unlike most of my work, this piece was designed to be manufactured as an edition, and history moved forward at a faster pace than institutional approval and production. So now, it's not a protest- it's a celebration!In my work, I like to be able to design and wear something pretty quickly, while the topic at hand is fresh. So it's always a challenge to design something that might not move at my own pace. I'm interested in the way that time can change the work, and how the freshness of the topic can be interpreted over days and years. For Lisa Anne Auerbach it seems activism and protest are more important in her sphere(which makes sense, after all she is in L.A.) which makes open political statements the focus of her art. For Daniela Edburg, I believe she is trying to communicate on a deep level and strike at the core of what social convention is, rather that just make a statement. Both are equally effective in what they do. Auerbach seems more youthful, but that may be yet another sign of her environment. She may not yet have the goal to be exhibited on an International scale, it doesn't seem to be her goal to be in a gallery, although her work has been exhibited in galleries, on a small scale. Rather she seems to want to be of and for the people, which is refreshing, if not inspiring. i was really surprised that just a common idea of using a different craft while with in a different craft never came across my mind. i love how all of these artist are making a statement using a consuming craft to do it not the mere picture.